It’s safe to say that Ipoh, and indeed Malaysia, are not well known to most Hawaii residents. This is unfortunate, because this country is one of the friendliest destinations in Asia. It’s also got a food culture that is second to none. The heart of this culinary tradition can be found in Ipoh, a city of around 800,000 located a two hour drive north of Kuala Lumpur. A former tin mining center and administrative hub during the British colonial era, Ipoh today is a melange of Malay, Chinese and Indian cultures. 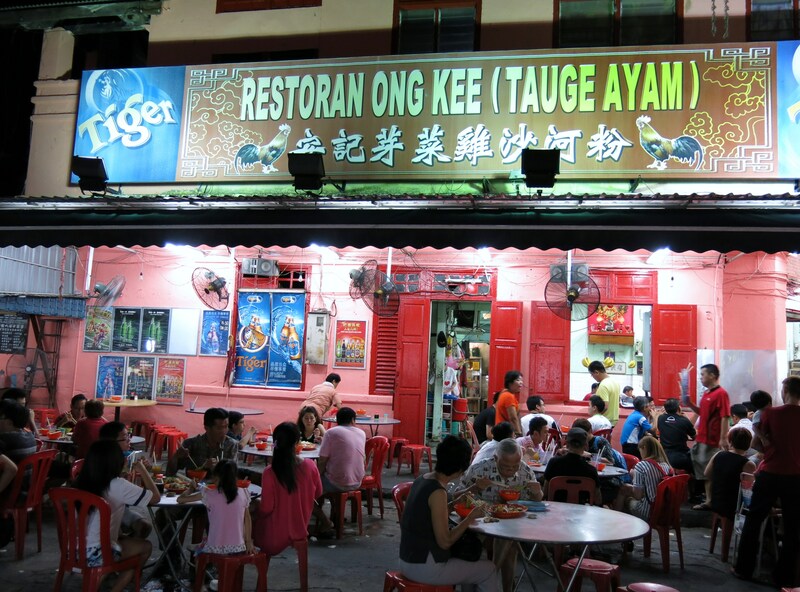 Ong Kee offers an iconic setting in Old Town Ipoh if you want to sample ayam tauge, a local signature dish. Chinese influence on Ipoh cuisine is strong. One thing it doesn’t have is throngs of tourists. The few that do come through, birdwatchers or backpackers en route to the Cameron Highlands, rarely stay long enough to explore the city. This is their loss. Ipoh, as Malaysians will tell you, is a mecca for foodies looking to discover culinary delights. From Indian Nasi Kandar specialties to Chinese dim sum shops, this town provides one of Malaysia’s richest food traditions. Our tour of Ipoh’s eating attractions begins with Ong Kee, an eatery in “Old town” which is the historic Chinese quarter. Surrounded by colonial era buildings that turn the clock back to the early 20th century, Onn Kee specializes in ayam tauge. This dish is comprised of whole chicken, which is poached until tender, then served with soy sauce, shallot oil and garnished with coriander, fresh scallions and thin slices of red chili. It may be accompanied with steamed white rice but in Ipoh purists swear by locally made Shanghai-style rice noodles. Ladling sambal to complete a serving of nasi lemak, the traditional, local breakfast. Make sure to order tauge — fresh, crunchy local bean sprouts–with your chicken– that give this dish its name. The locally grown sprouts give ayam tauge a real edge over imitations found in other parts of Malaysia. The landscape around town, filled with craggy limestone bluffs, is known for the purity of its water and the sprouts grown here have a sweetness that you won’t find in elsewhere in the country. The quality of the water is everything, as Xiang Lee, our Ipoh guide, informed us. Price is $3-4 per person. 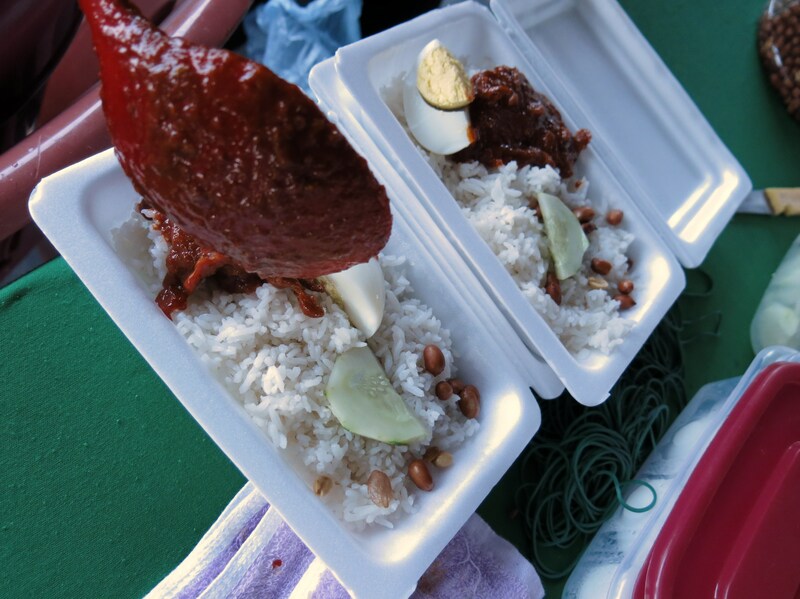 Another Malaysian staple, nasi lemak is a traditional breakfast dish served at stands around the country. As Xiang pointed out, the Malays traditionally serve the best. One can find nasi lemak stalls all over town but your best bet is to ask a local to point you in the right direction. Don’t expect anything fancy and don’t worry about eating “street food”. This delicious confection starts with white rice cooked in coconut milk, then topped with peanuts and dried, salted anchovies. It is usually garnished with a slice of boiled egg and sambal a spicy condiment that is synonymous with Malaysian cuisine. Don’t leave Ipoh without trying the Malay satay. They are served with cucumber and onion. Malaysians will differ, but its essential ingredients will include ground or pureed chilies along with turmeric, shallots, garlic, lemon grass, lime juice, tamarind, shrimp paste, as well as a touch of salt, sugar and ginger. Price is $1-2. 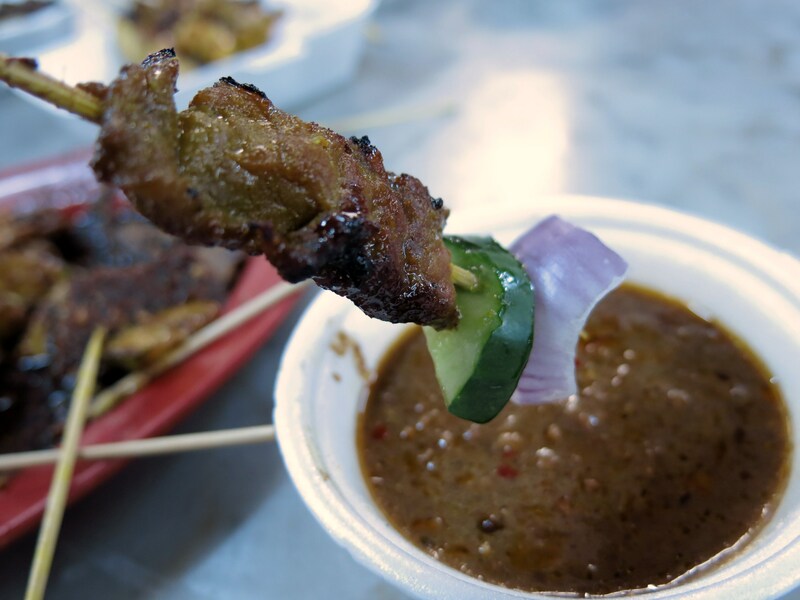 When you visit Ipoh, don’t fail to try Malay satay a signature dish created by Malays. Marinated skewers of lamb, chicken or beef are slowly grilled and presented on a small platter along with a bowl of peanut sauce. Malaysian satay cooks are reluctant to disclose the family recipes however, most include red chilies, dry roasted (unsalted) peanuts, garlic, coriander, ginger, tamarind pulp and lemon grass. The rest is up the creativity of the cook. Price is $3-4. Nasi Kandar, food stalls found throughout Malaysia offer delicious takes on Indian Muslim cuisine such as Biriani rice, tandoori chicken and freshly baked nan breads. Don’t forget to order a green coconut to go with the spicey fare. We paid about $5 for one tandoori chicken and two green coconuts. 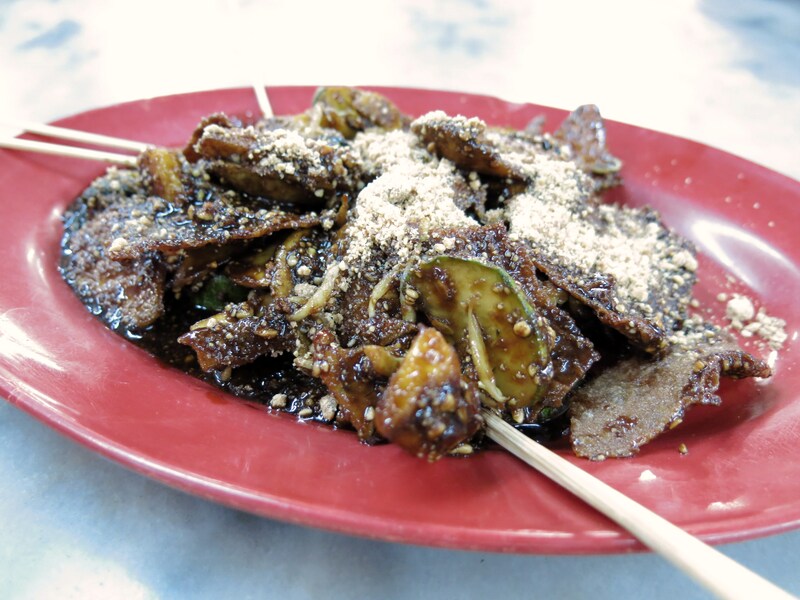 Rojak, Ipoh style has a Chinese twist—it’s a concoction of sambal mixed with sweet bean paste sauce, prawn paste, yam, green mangos, cucumbers, bean sprouts, special Malay crackers– all topped with crushed peanuts. An absolute must in Ipoh. One serving of Rojak was about $1.50. This version of rojak is a Chinese variation on a Malay theme. This concoction crackers, green mango, pineapple and other ingredients doused in a tangy sauce was killer. Don’t leave Ipoh without sampling Indian food. Sri Ananda Bahwan, located in “Little India”, Old Town Ipoh, is an Indian eatery typical of the “banana leaf” genre. While you can still get curries served on real banana leaves, here you’ll find traditional masalas, kotu paratha and tandoori chicken served on metal trays. The clientele is 100% local but don’t be shy. Point at whatever suits your fancy. We found the service very helpful and friendly. In the evening you’ll find the ovens going full bore with fresh nan and chapatis. We thought the food was excellent and on a Wedneday evening was packed. If the restaurant is full they will extend tables out the sidewalk. Meal for two, including mango lassi drinks was around $10. Conclusion: It’s hard to find destinations that haven’t been tromped and stomped over by tourists. If authenticity is important in your culinary explorations, a visit to Ipoh will not disappoint. Getting there: The best, and least expensive way to get to Malaysia from Honolulu is via Hawaiian Airlines, which among other Asian destinations, has routes to Seoul, Tokyo and Osaka. The route went via Seoul connecting us to Kuala Lumpur. From Seoul we took Air Asia, a low-cost airline headquartered in Malaysia. It’s a no frills carrier that operates scheduled domestic and international flights to 100 destinations in 22 countries. Going upscale? 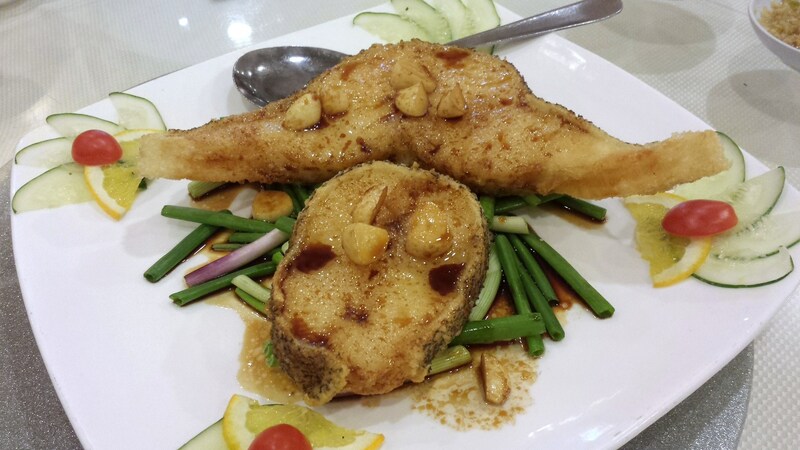 Try Restoran Kok Thai in the Tasek area. They specialize in Cantonese cuisine. Chef and owner, Ku Swee Hoong sources most of his ingredients locally. The sea cod, pictured above was superb. Air Asia Group is divided into two divisions— a domestic carrier, Air Asia, and Air AsiaX, the company’s international subsidiary that covers the long haul routes. Service was excellent. (I wish they would fly to the US!). The pilot was charming and rather chatty, reminiscent of the friendly and relaxed manner typical of SouthWest Airlines in the US. In fact the whole concept of Air Asia reminded us of Southwest: Inexpensive fares, great service and a modern fleet while paying for extras such as meals, drinks, etc. Flight time between Honolulu and Seoul was about 9 hours. The link between Seoul and Kuala Lumpur was about 6 and half hours and Air Asia operates this route daily. We did not know what to expect with this carrier and were very pleased. Service was great–flight attendants were efficient and friendly. Food was tasty and a vegetarian Indian curry cost an extra $8. The only thing I would have liked to see on the flight was an electrical outlet for a laptop. The flight attendant said that this was only available in business class. The round trip flight between Incheon and Kuala Lumpur was around $600. They offer several types of Y class fares and we opted for a slightly higher “premium” class that allows one to change dates without paying a penalty. It came in handy because we need to extend the trip. Rob Kay is a Honolulu-based writer and the author of Lonely Planet guides to Fiji and French Polynesia. Kurt Stewart is a Malaysia-based freelance writer who has contributed to USA Today, Passion Magazine in Paris other publications. He is currently doing research for a book on Malaysia.